Is anyone else feeling the post-holiday-weekend-Monday blues? I escaped for a long weekend in the Catskills with friends - fireworks, bonfire, barbecue and knitting - lots of knitting! I thought about posting this pattern before the weekend and then thought it might be a fun pick-me-up for the aftermath. I hope it finds you feeling restored wherever you might be. Notions: You'll need 4 stitch markers - I recommend having one in an alternate color to be used to indicate the beg of round. Blocking wires or blocking pins - whatever suits your fancy for blocking lace-type pieces, and as always, a trusty, blunt tapestry needle. 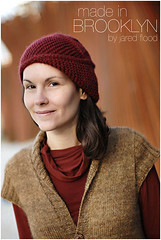 If you're a Ravelry member and prefer acquiring this pattern there, click on the Ravelry button. If you aren't on Ravelry or prefer PayPal directly, click on the PayPal button. I have plenty of knitting to show - it just needs to be photographed. I'm closing in on my merino/cashmere pullover and having fun with new yarns and Shetland lace. Oh my! Oh YAY! Thank you for sharing it! And congratulations on the soon-to-arrive nephew! I anticipate many beautiful miniature tweed sweaters! I love this blanket - thanks for the pattern! I'm always concerned about wool for babies, though. Maybe it's just me, but I would never use something for a baby that I would have to hand wash - I always figure a new mom has enough to do without adding that burden! Also, as someone with lots of allergies and sensitivities in the family, I would want something ultra-soft for a little one! But the blanket is gorgeous, and I would make it for an adult in a heartbeat! A lovely throw or housewarming gift! Yay! My failed cardigan will get a new life as a blanket -- just what I needed. This is gorgeous. I loved the original post, but I will have to make this for the next baby blanket request. Simple and classy looking. Lovely! 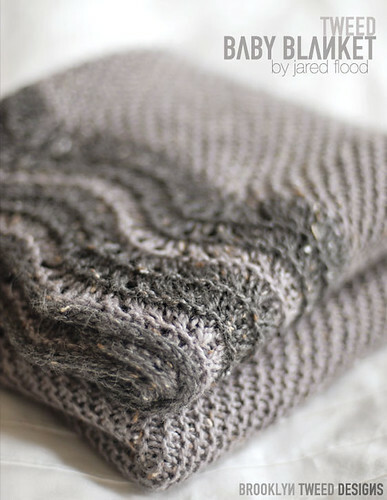 That City Tweed DK is certainly a showstopper, and I like that you let the yarn speak for itself in this blanket. I finished my Girasole recently and it's been hauled out to show off to everyone who darkens my door ever since. Thanks for putting in the work to make simple patterns that turn out so well! Thank you for offering a Ravelry alternative. I wish more designers would do this. I'm so excited about this. My friends are having their first baby in November, and they are going to need something cozy and warm to welcome him or her into the nest. 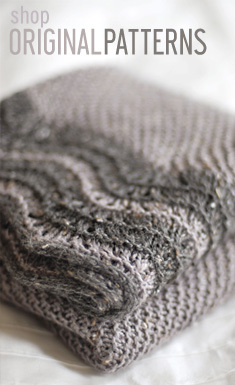 There is nothing lovelier than a handknit gift the baby won't outgrow. If it is well cared for, baby blanket morphs seamlessly into heirloom lap blanket. Thanks, Jared! You are my knitting hero. Some wool can be machine washed and merino can be very soft. Babies can have wool. It's the best! Love your photos Jared. Your great projects are showed off wonderfully! Oooh...I admired that blanket when you first posted it. Thanks for sharing the pattern. Can't wait to see what's next! Simply elegant. Very well done. Beautiful homage to hap shawls! Gorgeous blanket! Your photographs are always stunning. this must be a very popular design idea. Absolutely beautiful! I've been waiting on the pattern! Thank you. I have been hoping and waiting for this!! Yays! I was so hoping for you to write this up! I got the yarn right after your first post! TeeHee! Beautiful and the color is just stunning. Thank you so very much! I plan to knit this with a matching Baby Surprise jacket in time for an October arrival! This is a lovely blanket, thanks for writing up the pattern for us! Yowza! That is ONE nice baby blanket. Congrats!